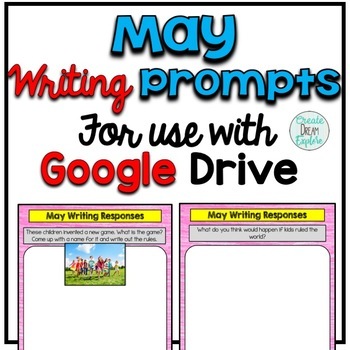 This is a set of 20 digital writing prompts for the month of May to use in Google Drive. These are meant to be used in Google Drive and shared with your students. Instructions are included. The writing prompts include questions to promote higher order thinking skills. The prompts include words such as "describe, explain, list". Some of the prompts are thought provoking and some are more simple. This is a great way to begin a journey of going paperless or to simply include more technology in your teaching. Students love to interact with technology and can be more motivated to write when using a computer. There are 3 different versions included in this file, one is in google slides, one is a folder in google docs so that you can share each prompt individually with your students and the other is just one google doc with all of the prompts listed so your students can work in one file. It's up to you which file you choose to use.